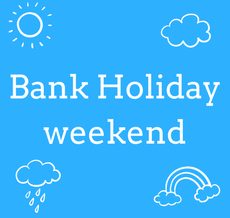 Monday 1st May is a Bank Holiday, which means no school and a 3-day weekend. Hooray! We think the extra-long weekend is the perfect time for going on an adventure whatever the weather, and where better to discover new worlds, sail the seas and fly as high as a bird than in a book? Maybe you’d like to step into new lands at the top of the Faraway Tree with Moon-Face, Silky and the Saucepan Man? Or turn into a unicorn in Blossom Wood like Lei, Isabelle and Cora? Perhaps you’d rather grab a broom and fly to Hogwarts? We believe that books can take you anywhere, so whichever book adventure you choose to go on this weekend, we hope you have an amazing time!